Danny Cooke visited the area for work on "60 Minutes"
(CNN) -- Time has effectively stood still in the Ukrainian city of Pripyat, which was evacuated in the aftermath of the 1986 Chernobyl nuclear explosion. At the time of the disaster during the Soviet era, about 49,000 people lived in Pripyat, located less than two miles from the Chernobyl Nuclear Power Plant. They left behind schools, homes, factories, parks and gyms that have remained largely undisturbed for the past 30 years. 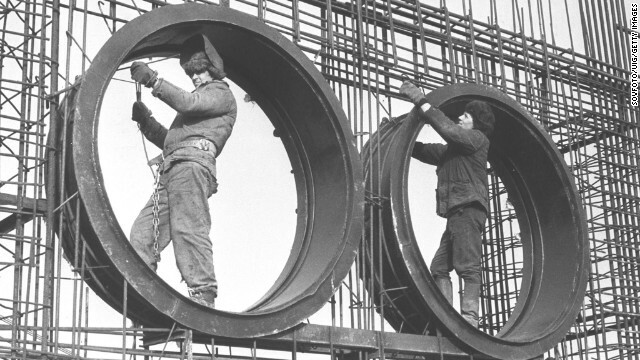 Laborers work on construction of the Soviet Union's Chernobyl nuclear power plant on July 1, 1975. The Chernobyl accident is the world's worst nuclear accident. The disaster sent a cloud of radioactive fallout over hundreds of thousands of square miles of Russia, Belarus and Ukraine. The radioactive effects of the explosion were about 400 times more potent than the bomb dropped on Hiroshima during World War II. 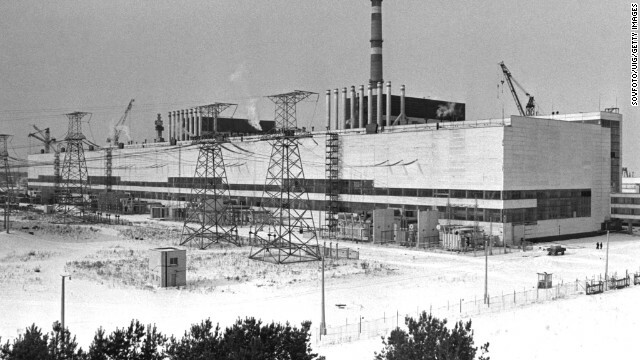 The station came on-line in 1977, two years before this photo, and contained four reactors, each capable of producing 1,000 megawatts of electrical power. 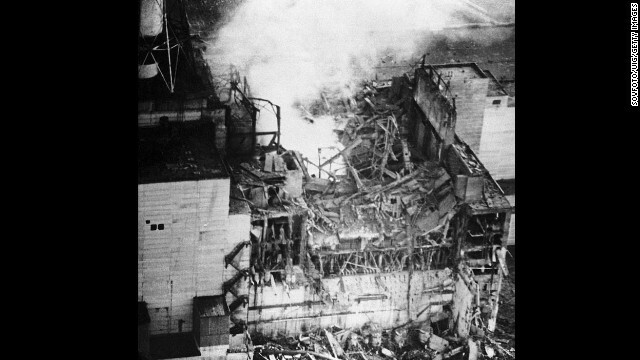 Reactor number four exploded on April 26, 1986, releasing large amounts of radiation into the atmosphere. More than 100,000 people were evacuated from their homes. 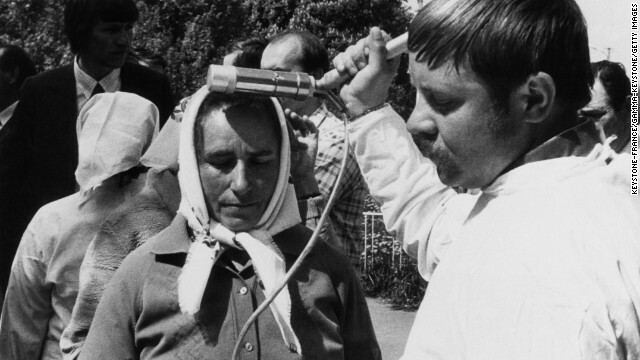 People are scanned for radioactivity before evacuating the Ukraine in this undated photo. Three days after the explosion, on April 29, 1986, cranes are seen at the power plant. 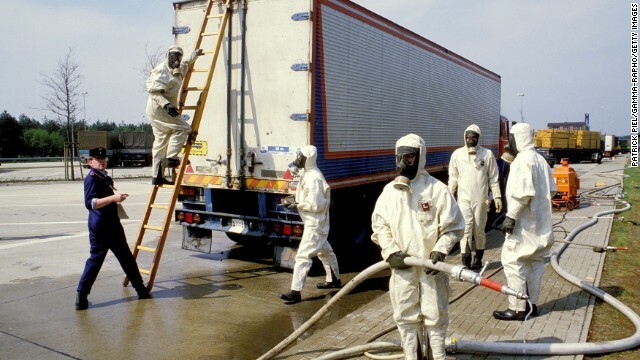 The disaster initially killed 32 people, but according to the United Nations, the explosion and fire that occurred affected, directly or indirectly, 9 million people because of the radioactive materials released into the atmosphere. 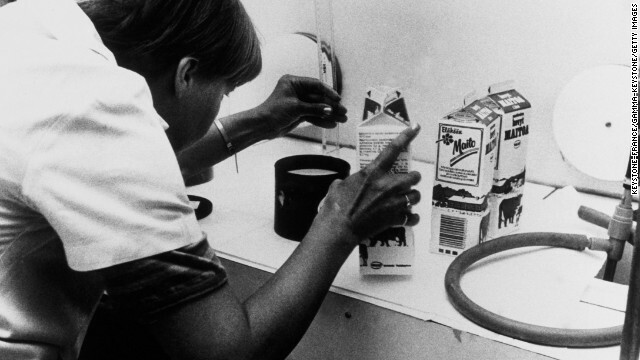 In Finland, milk is tested by authorities for aftereffects of the radiation on April 30, 1986. West German Customs officials closely screen goods, cars and people coming in from Eastern Europe on May 5, 1986. 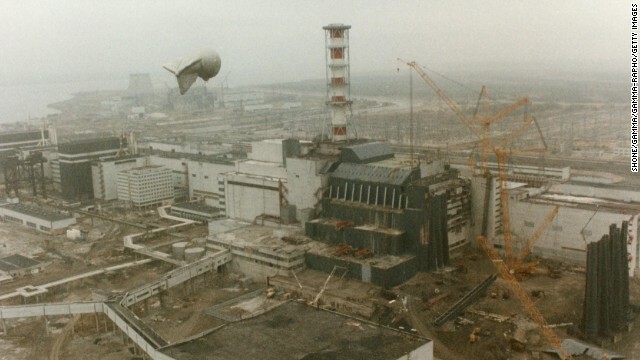 Radioactivity from the Chernobyl nuclear plant threatened to contaminate crops. 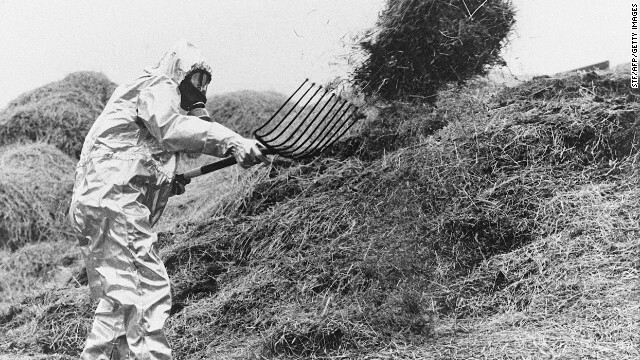 A farmer in Sweden wears anti-atomic clothes as he sifts hay possibly contaminated by the radioactive cloud from Chernobyl in June 1986. 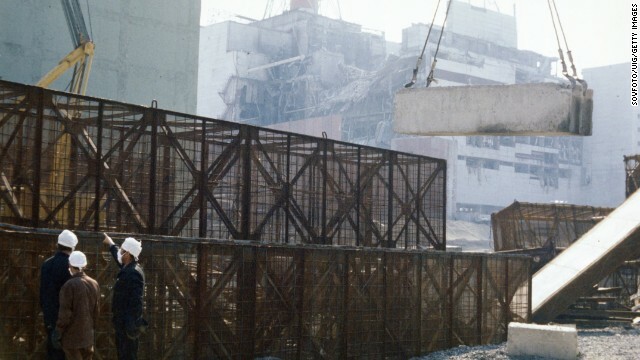 Construction crews build a containment wall around the damaged unit four reactor in August 1986. 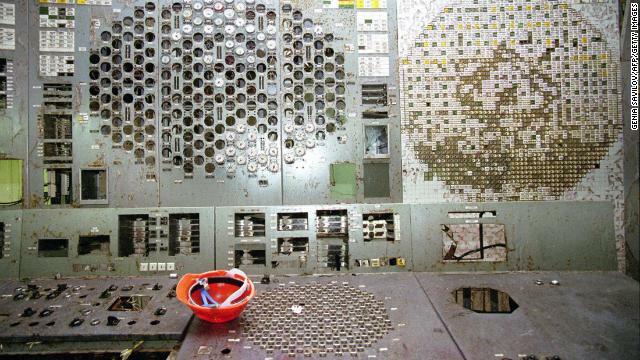 Control panels of the destroyed fourth power block on April 14, 1998. 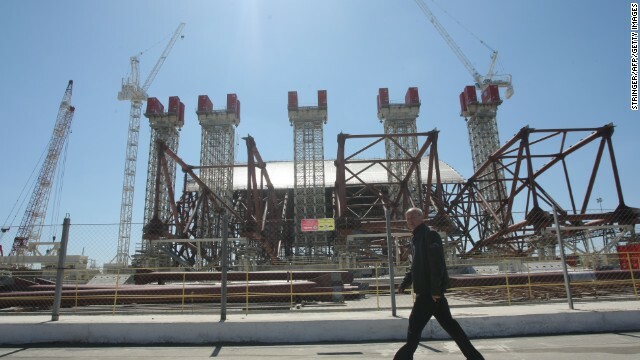 Twenty-seven years after the nuclear disaster, engineers work on April 26, 2013, to construct a colossal arch-shaped structure to permanently cover the exploded reactor. Armed with a camera and a dosimeter Geiger counter, cinematographer Danny Cooke explored the remains of Pripyat and Chernobyl. He pieced the footage together in a three-minute video that boasts drone footage of sweeping shots of abandoned buildings and parks. He also photographed building interiors on foot, capturing haunting scenes of empty schools and homes. Cooke visited Pripyat and Chernobyl in June while working for CBS News on a "60 Minutes" episode. He created the video to showcase his camerawork from the shoot for his portfolio. It was his first time there, though he has memories of Chernobyl's effect on his family living in Italy at the time. "The nuclear dust clouds swept westward towards us. The Italian police went round and threw away all the local produce and my mother rushed out to purchase as much tinned milk as possible to feed me, her infant son," he said. "It caused so much distress hundreds of miles away, so I can't imagine how terrifying it would have been for the hundreds of thousands of Ukrainian citizens who were forced to evacuate." The visit was a life-changing experience, he said. "It's very hard to explain, however, I feel different from when I set foot into the zone to when I left. My perspective of life changed slightly," he said in an email to CNN. "On approaching the zone, I was aware that radiation is an invisible sensation but regardless my body reacted in a psychological way. My brain was telling me that perhaps I'd made the wrong choice and this wasn't such a good idea," he said. "It was too late to go back now, but I'll never regret ever entering the zone. The sight of the school canteen floor in Pripyat will be something I will never forget in my lifetime. What the evacuees must have gone through is unthinkable."